MONTREAL -- Canadian National Railway has been fined more than $1 million for violating the Canadian Environmental Protection Act. Environment and Climate Change Canada says the Montreal-based railway pleaded guilty on Monday to importing a fuel that does not meet the requirements of renewable fuels regulations. 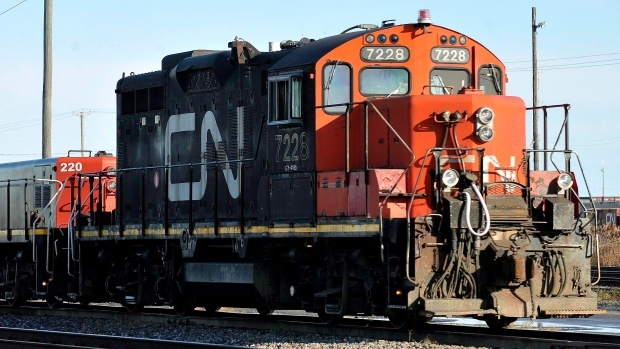 CN Rail was fined $25,000 and ordered by the court to pay $1.1 million to promote the protection of the environment. An investigation found that between July, 2011 and December, 2012, CN imported more than 224 million litres of diesel fuel. However, it didn't meet the requirement that at least two per cent of the company's imported volumes be renewable fuel, unless renewable fuel compliance units were acquired. The threshold is five per cent for gasoline. Railway spokesman Patrick Waldron said the case stems from CN's fuel use during the first year of the new regulations. "CN has fully complied with these renewable fuels regulations in every subsequent year," he said in an email. Waldron said the $1.1-million payment is equal to the amount of credits, or compliance units, that should have been paid for in that initial one-year period, based on fuel imports that year from the United States.